I have had a great week so far, and much of it has to do with some (what I consider) very good posts, good traffic (thanks again to all that tip’d articles) and some exposure on other sites. In lieu of this success and fanfare, I’ve decided that it’s time for another giveaway. 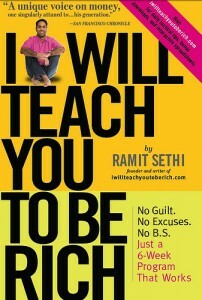 This time, it will be Ramit Sethi’s I Will Teach you to be Rich. You all saw what I think of this book in my review from a few weeks ago, and now it’s time for me to pass this piece of wisdom on to someone else. Since comments here are not numbered, the first comment shows at the bottom and the newest shows at the top…that means if you are 3rd from the bottom, you are routing for the number generator to pull a three, genius. Good luck, and do not forget to tell your friends about this opportunity! And the winner is….KOOKIE! Congrats, now check your email to claim your winnings! A drawing on lucky August 7? Fabulous! Count me in. SINCE I STILL DON’T HAVE MY ORIGINAL BOOK WINNINGS i thought perhaps i’d throw my name in the hat for this one…that way if i win Matt only has to pay for shipping one package of two books. Well, after reading your review, I’d certainly like a chance at that book!